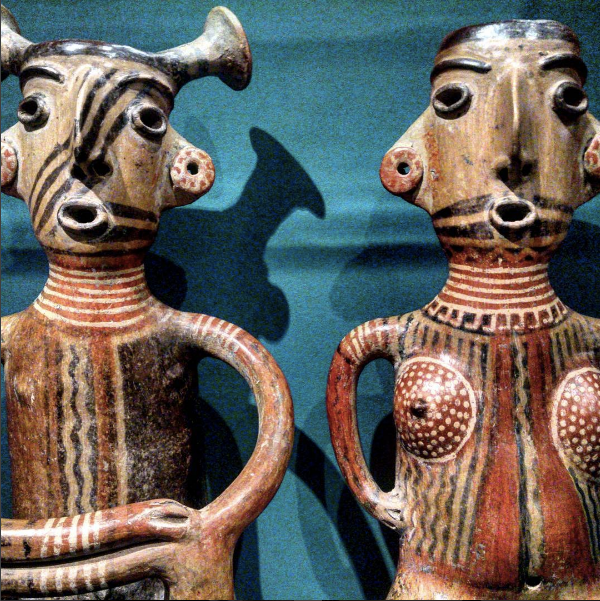 Why do people collect illicit antiquities? A not unproblematic answer can be found in Bourdieu’s idea of cultural capital, which sees the outward acquisition of and appreciation of artworks as being symbolic of an individual’s embodied cultural value/worth. It represents taste and knowledge that one can’t simply buy, one has to devote time and effort to it. Thus the collection and display of antiquities of different kinds and the understanding of them, sends signals about the collector’s place in the world and in society. Collectors want those signals to be sent, even if only at an unconscious level: appreciating the art is genuine, indeed it must be genuine for the cultural capital to really do what it does. Any Bourdieu scholar out there is rolling their eyes at me. Whatever, this is a short blog entry that is really just a vehicle to show y’all some photos. 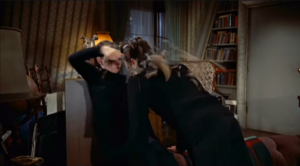 On a recent flight back from a workshop on illicit trafficking in DC I found myself watching the film Funny Face (1957) for the first time. Not my usual flight fare but they had exactly zero baseball films on offer. Yes, I really do find watching baseball films on planes to be relaxing… Luckily Funny Face had stuff to think about. 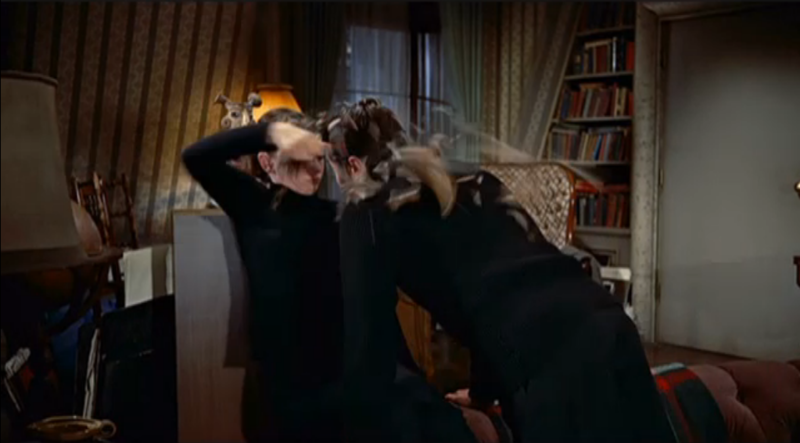 Also luckily, I was watching it on my computer so I was able to take screen shots. 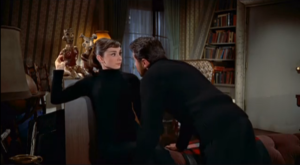 The film consists of the creepy 58-year-old Fred Astaire pursuing 28-year-old Audrey Hepburn, convincing her to drop her dumpy clothes and love of books, french philosophy, and interpretive dance, and to become a fashion model who makes out with him and dances conservatively. 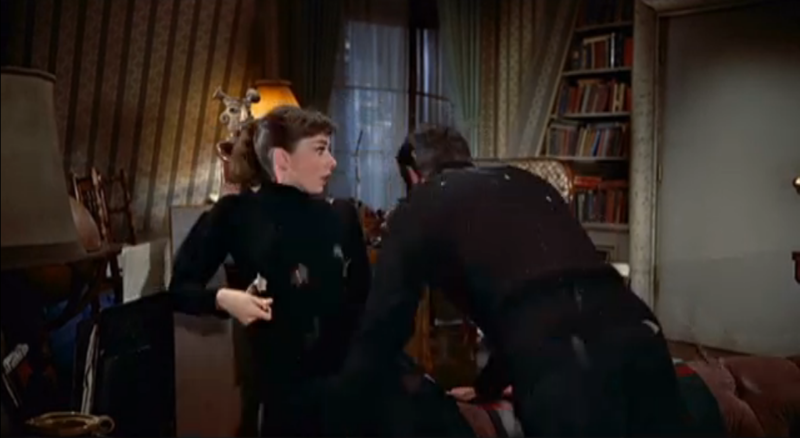 I mean, seriously, Hepburn’s character is introduced when Astaire and his boss wreck her book store and he kisses her square on the lips without asking. She only gets to go to Paris to attempt to live out her academic and intellectual dreams if she becomes their show pony, their dress mule. I wasn’t impressed. What did catch my eye, however, was the flat decor of the 35-year-old “Prof. 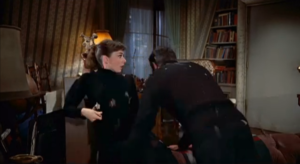 Emile Flostre” (Michel Auclair), the French philosopher that Hepburn’s character is obsessed with who, too, also makes an unwelcome physical advance (yet somehow that one is bad, but Astaire’s is good). The Parisian Boheme of 1957 appears to be “Pre-Columbian Antiquities”. Not the socially acceptable forms of Greece or Rome, no. Our beardy hipster philosopher only has the “Tribal”, the “Primitive”, “the Other”, at a time when everyone seemed totally okay with applying such racist words to whole swaths of the world’s art. Look behind her! Those are two Jalisco figurines from Mexico! For reference, on the left are two that I photographed at Yale’s Art Gallery (then subsequently over-filtered for the social media). Why Jalisco figurines? 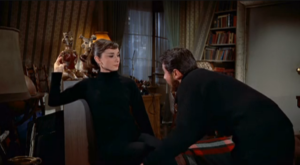 Well they are most certainly not Western and to a mid-1950s public, they must have seemed strange enough to signal “weirdo beatnik”: they more or less match Hepburn’s and Auclair’s black turtlenecks and tight trousers. For the character of Prof. Emile Flostre, the cultural capital symbolised by appreciation of non-Western forms in his philosophy circles was probably quite the draw. Look at him, the white male, thumbing his nose at Western traditionalism as he forces himself on young women against a pedestalled ancient Mexican backdrop. How hip. I’ll say one thing for the Prof: he knows a good deal when he sees one. At one point in the film he moans that just one of those figurines cost him 200,000 francs! With the help of an online currency converter, I found that 200,000 “ancient francs” in 1957 is 364.69 USD in 2017. That’s quite a steal. For reference, follow this link to a not-really-the-same seated Jalisco couple that sold for $362,500 at Sotheby’s in 2012. Note that the provenance of those pieces is listed as “Bloomingdale’s 1968”. Yes, the department store. Fitting that Price’d collect tomb stuff. I found South American mummy bits from his collection at Sotheby’s. 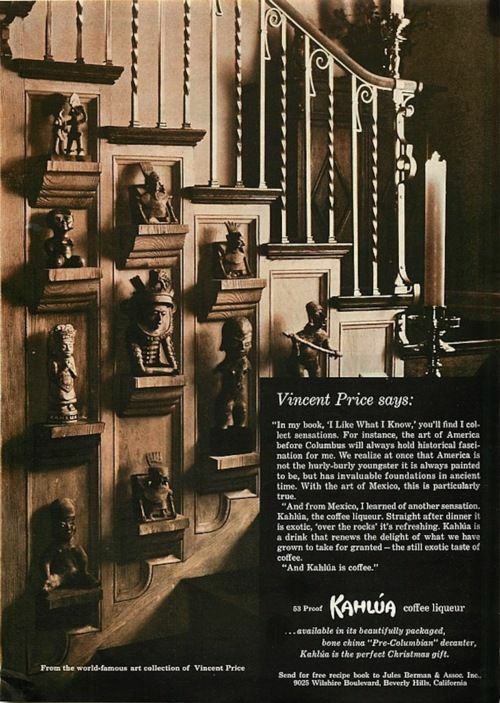 Similarly, “rich person’s apartment chic” for the Grable/Monroe/Bacall flick How to Marry a Millionaire (1952) was also “Pre-Columbian Antiquities”, though seemingly not with the Bohemian vibe, rather more Rockefeller-esque. 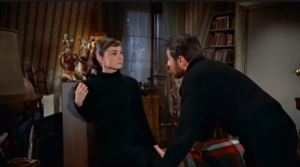 Nelson Rockefeller, of course, was both stinkin’ rich and collecting Pre-Columbian pieces at the time so it fit with the film’s theme. Same stuff, different feel. 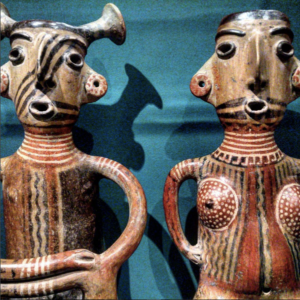 Pre-Columbian antiquities were rather hot in Hollywood and New York through the 1950s and 1960s thanks to some enterprising dealers who injected themselves into silver screen society. It makes me wonder if they were direct consultants or suppliers for these films or if Pre-Columbian was just something in the air that set designers picked up on. The stuff was certainly around. 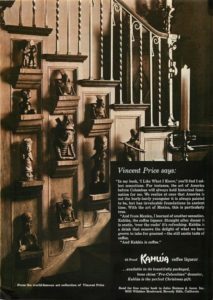 Collectors of objects looted from Western Mexican tombs included folks like creepster Vincent Price. 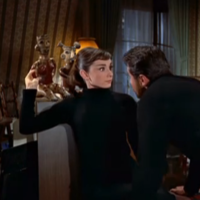 On the left is his collection of Mexican figurines in a Kahlua ad. I can’t make this up folks.